During the second week of settling into university, tackling new assignments and dirty kitchens, an email landed in my inbox one morning, inviting me to the first birthday party of one of my favourite shows, In The Heights and Kings Cross Theatre! To say it made my day (or week) is an understatement. 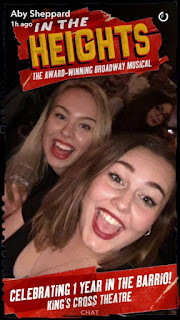 My new friends Jo and Aby accompanied me to London and on Friday 30th September we arrived at Kings Cross Theatre to celebrate one year of In The Heights! I first saw the show back in July where I completely and utterly fell in love with the whole production. Check out my initial review here. So I was beyond excited to revisit it with new additions to the company! We arrived at Kings Cross Theatre to be greeted with a much-needed glass of wine (after driving from Cornwall to London that same morning), a programme and our tickets for the evening. After mingling with some other bloggers and media/ press, we all made our way to the impressive stage for a salsa class with the awesome Rafaella Covino (Swing & Dance Captain) and Johnny Bishop (Graffiti Pete). They taught us a routine called 'The Arm Breaker' which is featured in one of my favourite scenes in the show, The Club. 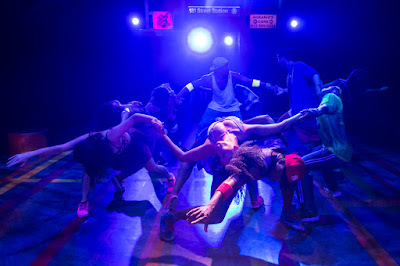 Set to super fast-paced, sizzling salsa music, the choreography (like all of the dance in the show) was mesmerising. After a few attempts and support from varying members of the cast, me and Aby finally got the steps down to a T and have been salsa dancing together ever since. Look out for us to be featured in the next cast of ITH... just you wait..! After some more wine and food, some of the cast came to chat to us as well as Simon Marlow, the production manager of the piece. It was great to talk to the company and crew, to get a real inside view of the production. Something that really struck me was the overwhelming sense of passion and dedication of this piece. Every single performer and backstage worker there were real fans of the show and its so refreshing to see people love what they do so much. I found it really inspiring. 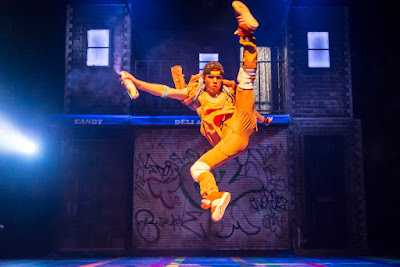 Aby and I sat down with Sam Mackay who plays the lead role of Usnavi, which you can catch in another blog post. From the very opening of the show, when the first beats of that hypnotic score begins to play, I am completely mesmerised. Sam Mackay as Usnavi opens the show with the titular song, 'In The Heights' where he acts as a narrator who introduces the tight- knit community of Washington Heights, Manhattan's most vibrant community which is on the brink of change. 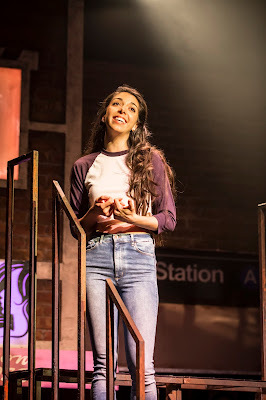 Though Sam leads the production as the charismatic, kind of dorky, but fully loveable character of Usnavi, it is totally an ensemble piece of theatre as every character helps to carry the show effortlessly and with heaps of energy. 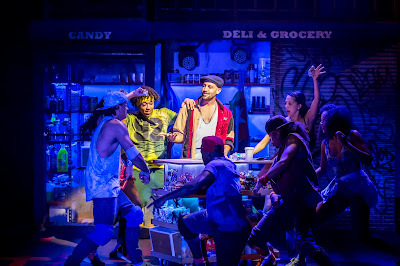 We follow the stories of various members of el barrio, including Nina who drops out of college, Benny who falls deeply in love, Vanessa who's running away to a new life, Daniella who is taking the next career step, Abuela Claudia who bags the luckiest/ unluckiest days of her life and of course, Usnavi whose there between it all. The engaging stories are fueled by Lin- Manuel Miranda's famous contemporary score of vibrant latin/ hip-hop infusion. Its one of my favourite scores to date and is the only music that never fails to make me cry as well as dance. I find it difficult to choose favourite songs but '96000' and 'The Club' have to be up there with some of my favourite musical theatre songs of all time, let alone just in this show. The witty lyrics alongside the sizzling hot beats make the music the pulling factor of this phenomenal show. To complement the insane music is some of the best choreography I have ever witnessed. Drew Mconie utilises the fusion of latin and hip-hop in his choreography so well and the burst of energy and passion from the stage is infectious. Its technically outstanding and fits the story of the show so well. The ensemble are out of this world performing it. A handful of the original cast are still performing in the show: Sam Mackay has been killing it as Usnavi since its run at Southwark in 2014, Gabriela Garcia makes a stunning Nina, Johnny Bishop as Graffiti Pete, Norma Attallah as Abuela as well as some fantastic ensemble members. Recently some new cast members have joined the family, including Arun Blair- Mangat who plays a charming Benny and Juliet Gough makes a fierce Camilla. Sarah Naudi has been with the show since its opening back in 2014 at the Southwark Playhouse and is finally playing the role of Vanessa full time. I saw her understudy the role earlier this summer and she is beyond perfect for it. She rules the stage with her confident presence and outstandingly effortless powerhouse vocals. Damian Buhagiar returns to his role as the adorable Sonny and Jocasta Almgill slays as the sassy Daniela. All of the aforementioned cast as well as the additional ensemble and swings are phenomenal. They make the show what it is with their amazing energy and obvious passion for the show and its story. I could honestly talk about this show all day and I am desperate to see it again before it closes its doors of el barrio on January 8th 2017. Its one of my favourite shows out there at the moment and I urge everybody to see it. 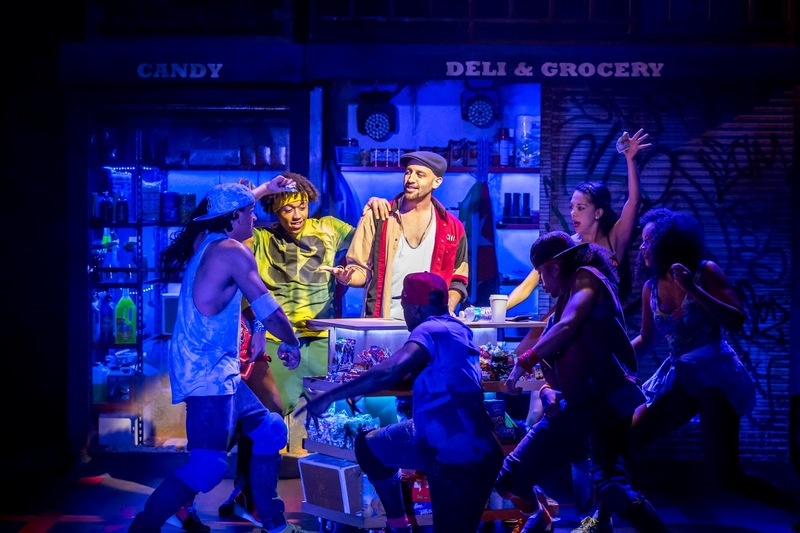 In The Heights is showing at Kings Cross Theatre in London- tickets start at £22.50, with a selection of best seats available for Under 25s at £15 per performance (AMAZING!!). Go get your tickets now! Thanks again for In The Heights for inviting me and Aby along for this fantastic evening of celebrations. I couldn't have asked for a better evening at my favourite place. Keep an eye out on my blog for my interview with Sam Mackay! Disclaimer: I was invited to this event by In The Heights/ Raw PR but all thoughts and opinions are my own, as always! Nice post, Ellie:) Like always. I also wnat such party, it's wonderful and so exciting. Thank you for inspiration. If I need some insparation, I read your blog. Besides, here some really cool stuff.